As a learning technologist for EAP students, I see one of my main roles as helping level the playing field for them. Linguistically, they are always going to have to work twice as hard as the native speakers on their university courses. Reading articles, taking notes on lectures, writing essays: all these things will take twice as long for them and will demand twice as much mental energy. But as a technologist, I can help give them shortcuts that will make it easier to do some of these tasks. Things such as using reference management software to make the collection and annotation of articles easier and to quickly generate bibliographies; better search skills so they can more effectively find the source materials they need for their research; or just using something like Google Docs so they can continue to work on their writing regardless of the computer or device they have I front of them. One rarely explored area that can really help them is text expansion. This term covers a whole range of tech tools and services but in short it’s the ability to save and retrieve commonly used text chunks through your browser, computer or mobile device. This can be done through copy/paste or through a shortcut. To give a few examples of what I mean: for common email replies, you could type the letter tyem and that would automatically expand to thank you very much for the prompt reply to my email. Or typing a text message, the letters omwh would become on my way home. Or maybe you find yourself needing your work address frequently for online forms and you could go to a browser extension that would automatically copy and paste that for you. When writing essays, they could quickly type/access commonly used phrases such as on the other hand, according to or there are clear differences between. When taking lecture notes, they could use quickly access pre-fabricated phrases such as this important because, what this means for …….is. When filling out the endless online forms required of them by the university or their embassy or the NHS, they can quickly access home addresses, phone numbers and ID numbers without having to go searching for them. By using these shortcuts, EAP students will buy themselves more time to focus on the important things such as actually concentrating on their lectures/writing rather than spending needless time typing the same phrases again and again and fretting about whether it’s correct or not. 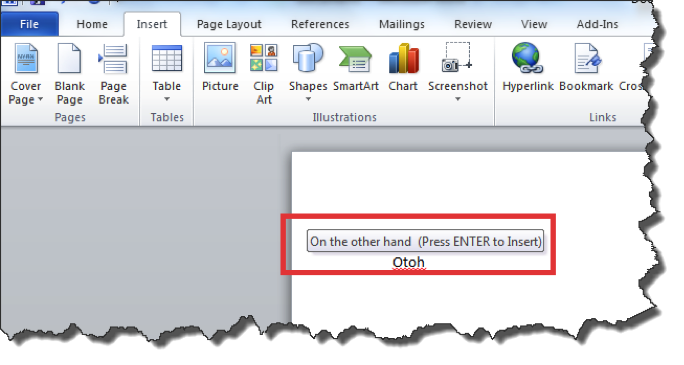 Little known feature in Microsoft Word, largely because it’s so expertly hidden. Shame really, because it’s so damn useful. When you type something in Word you think might be useful to reuse (common phrase, author’s name, task rubric etc), select it, then go to the Insert tab>Quick Parts>Autotext. You will then be prompted to save the selection to the gallery and you can assign the shortcut for it (e.g. otoh). In the future, you can type otoh and it will automatically expand or when you start typing ‘on the..’ it will automatically suggest the phrase by pressing enter. If you want access to repeated text in your browser (e.g. 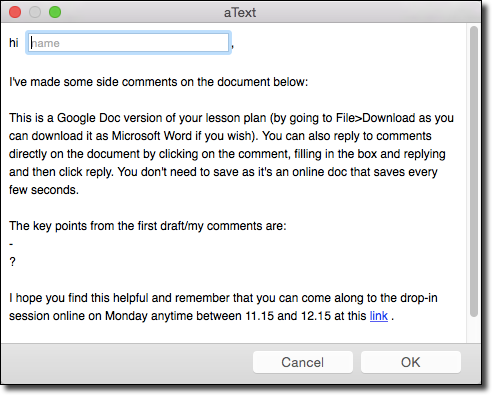 in your email, Google Docs, online forms), there are a number of browser extensions that can help with that. My personal favourite is the Firefox add-on, Clippings. You can create saved clippings from selected text on a page or just by typing and organise them into folders and subfolders. You can insert them into the page by either right clicking and selecting from the clipper menu or opening the Clippings box and dragging the phrase you want. Since it opens up a pop-out window, you can even use it in other applications such as Word or Powerpoint as long as Firefox is still running in the background. For a decent explanation of how to install and use it, go to this guide from the Kioskea website. For Chrome users, you can try Auto Text Expander or Pro Keys, with both of these you can define shortcodes for longer pieces of text. Just note though that neither of these work in Google Apps such as Docs or Sheets as they have their own shortcut menu (more about that later). 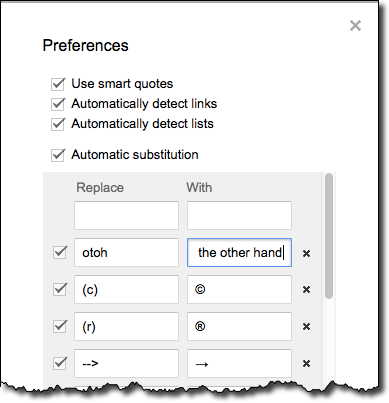 As mentioned above, the Chrome extensions Pro Keys and Auto Text Expander don’t work in Google Docs, Sheets and Slides because they have their own service, found in Tools>Preferences. This is pretty limited, all you can do is specify what you want a shortcut replaced by and there isn’t any easy way to batch import them from, say, a spreadsheet. Most people don’t use these as a lot of mobile communication is deliberately abbreviated anyhow, but more and more students are doing serious work on their phones and tablets now and so it’s useful to know how to access them. On iOS, via Settings>General>Keyboard, there is a shortcuts option that allows you to specify shortcuts for longer phrases. On Android, it’s slightly more complicated as it depends on the particular keyboard you use. The Google keyboard has it in Settings>Text Correction>Personal Dictionary but most other keyboards don’t though I’ve read that Smart Keyboard Pro – which is a paid app – does. If you want to be really serious about text expansion on your mobile device, you can buy dedicated apps/keyboards that can do it for you. Text Expander Touch for iOS is a customised keyboard designed specifically for text expansion. It is a paid app, which isn’t a problem if you really want this feature, but a bigger issue is that it is only available on apps that specifically support it, their website lists them all and very few of the ‘big’ apps (Twitter, Evernote etc) seem to support it. For the really dedicated, you can buy apps for your Mac or PC that will enable this feature across all programmes and browsers on your computer. 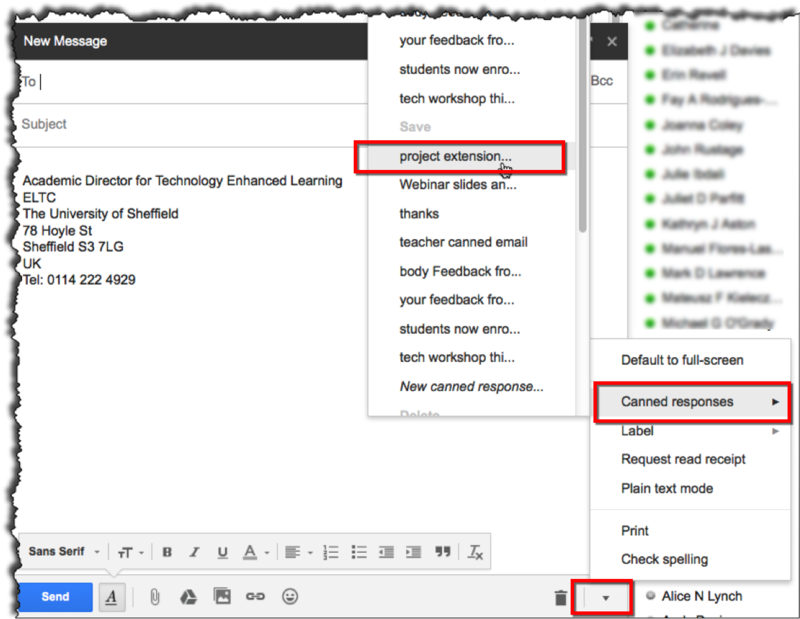 These have much greater functionality allowing you to create special shortcuts to add today’s date or to create chunks of text with customisable fields in them. For Mac users, the most popular programme is TextExpander, quite expensive at £26 but has a huge range of features. Very similar – and much cheaper – is Atext. This only costs about £4 and has virtually all the same features of TextExpander, so is highly recommended. For Windows users, you can use Phrase Express for free as long as it’s for personal use and you can synchronise it with the Phrase Express app on Android. I’ve used it and it has many similar features as TextExpander/Atext for Mac, though probably not as user-friendly. There’s also a paid app, Breevy, which costs £26 but I haven’t had a chance to use it so can’t comment on how good it is. Although this post is aimed mainly at students, text expansion is equally useful for teachers, especially in the routine tasks we have to do such as formulaic emails to colleagues and students, student reports, feedback on students’ essays, and writing rubric for tasks and tests. Initial setup of this can take a while, collecting all the phrases and remembering the shortcuts can be difficult but if students get into the habit of doing it, it can save them so much time. Nice work, David. I’m sure your students find these tools to be very helpful. Fantastic idea and thanks for the list. I teach a lot of Business English and these are tools all my students will appreciate.